Raider Truck Caps have been made for 20+ years by Raider Industries. The company is real heavy into the advanced technology surrounding the production and curing of fiberglass, the molding and cutting of the fiberglass and the door and windows components that get inserted into the fiberglass shell that ends up being the truck cap on your pickup. Whew, that was a mouthful! And that blurb was just for the recreational fiberglass truck caps that Raider makes. You can say just as much about the aluminum commercial truck canopies made by Raider, but I'll save that stuff for the commercial truck caps section below. 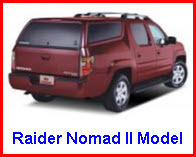 Raider Truck Caps benefits by being a subsidiary of Truck Accessories Group (TAG). TAG brings a lot of technology and manufacturing know how to the equation. You might recognize Leer, Century and Pace Edwards as some of the other premier manufacturers of fiberglass truck caps. They are all subsidiaries of TAG. 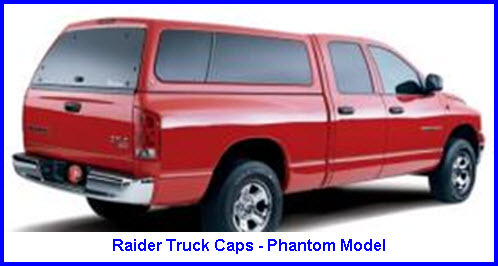 These Raider Truck Caps use a triple bonded fiberglass roof made by joining fiberglass, resin and a tri-cell honeycomb. This makes for a very strong structure that door and window holes can be cut into with a high pressure water jet cutting tool. The fiberglass roof is molded and cured very carefully to ensure a super smooth finish for the DuPont base paint and clear coat. Just what you need to get that sleek shiny appearance. 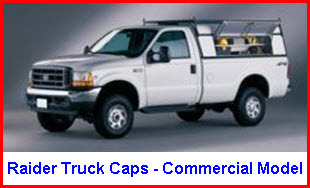 - Typical truck cap weight is 175 to 190 lbs. Raider Truck Caps newest model. Great style at a great price. The Vagabond Elite gives you 50/50 side slider windows with screens and a frameless, curved all glass rear door with a center mounted handle. My neighbor uses his truck with a Raider Cap for his lawn service business. So as you can guess he has a problem with gas and oil spills, water, mud and coffee messing up the truck bed. As I am currently using some universal absorbent car mat protectors in my truck to keep the dirt and water down in my floor pans, I generously gave him several of these mats to use in his truck. They seem to do a good job sucking up all kinds of liquids and they are easy to wash. Certainly they keep both our trucks cleaner and better smelling. Wow, what an awesomely strong and well built commercial truck cap from Raider! This commercial truck canopy comes with 5 roof bows supporting .030" gauge aluminum skin, .080" base rails, tube & flange construction and corner braces. The list of toolbox, window, door and other options is too big to list. You just gotta check out the Raider website and see for yourself.